The function of subcellular structures is defined by their specific sets of proteins, making subcellular protein localization one of the most important topics in organelle research. To date, many organelle proteomics workflows involve the (partial) purification of the desired subcellular structure and the subsequent analysis of the proteome using tandem mass spectrometry (MS/MS). 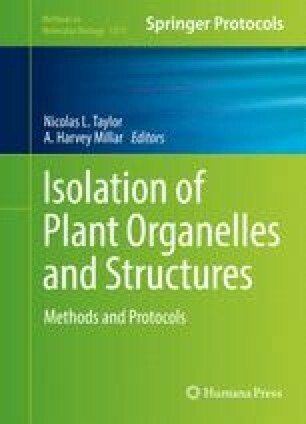 This chapter gives an overview of the methods that have been used to assay the purity and enrichment of subcellular structures, with an emphasis on quantitative proteomics using differently enriched subcellular fractions. We introduce large-scale-based criteria for assignment of proteins to subcellular structures and describe in detail the use of 15N metabolic labeling in moss to characterize plastid and mitochondrial proteomes. This work was supported by the Excellence Initiative of the German federal and state governments (EXC294 to R.R.). We thank Anne Katrin Prowse for the proofreading of the manuscript.